These head bolts are the original ARP fastener available for 1.8t 10mm thread. They are 100% reusable and are used just like stock head bolts are. If you would rather have bolts than studs, here is your option! These head studs are a new addition to the ARP line up. These 11mm head studs are spefically made for a 058 blocks in all 97-99.5 AEB Audi A4/Passats. These will also work on other engine code 20v blocks in other countries that have external waterpumps and are 058. With these studs you can unscrew the hardware with an allen key and take the head off just as easily as you can with stock head bolts! We recommend using these studs on any project making in excess of 600whp. We have made over 700whp on stock head bolts without failure but do not recommend it for extended use. All ARP hardware is reusable unlike the factory hardware. These head studs are a new addition to the ARP line up. These 10mm head studs are spefically made for a 06a blocks in all 99.5+ 1.8t mk4 engines, AWD, AWW, AWP etc as well as 2001+ audis with internal waterpump engines. These are a much better choice than raceware head studs for several reasons. Higher clamping load, better materials, allen key depressions broached into the end of the stud for easy removal and installation of the stud. This is very important because 99% of 1.8t transverse motors cannot remove the head with manifolds on while using head studs. You will hit the rain tray forcing you to remove you entire turbo kit. These main studs are specific for the 06a blocks. Make sure you have the correct studs for the application as the 058 studs found in earlier 1.8, 2.0, 8v, 16v, 20v engines are shorter and will not allow you to engage enough threads to properly fasten the crankshaft. These studs are for all 1.8t motors from 99.5+ mk4 1.8ts and 2.0L 8v as well as 2001+ audi a4 and passat with 1.8t engines. We recommend using these studs on any 1.8t engine making in excess of 500whp, we have made over 650whp on stock main bolts without failure, but we do not recommend it for extended use. ARP hardware is reusable, factory hardware is not, if you are building a powerful car, go with the ARP hardware and save yourself the hassle, buy the parts once and dont be stuck with replacing stock bolts and costly replacement. This is a complete head stud kit for the 12v obdI or obdII VR6. This kit will not fit 24v as the lengths are not correct. This kit comes complete with directions and arps moly lube for the hardware. ARP studs are superior to Raceware studs in clamping ability, material composition and installation/maintenance. These studs come broached with allen key depressions in the stud for easy installation or removal if taking the head off is not possible with the studs installed. Priced for each for VR6, 6 for 4cyl, 1.8t, 2.0tfsi, 16v, 8v, mk1, 2, 3, 4, 5. These bolts will only fit on vehicles with single mass flywheels. These bolts are a solution to the classic vw problem with rattling the flywheel off of the crankshaft from vibration, drive train shock and insufficient fastener clamping loads. red loctite on the threads, moly lube under the head. 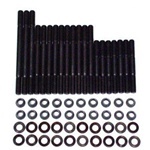 ARP head stud kit for Honda/Acura B16 engines. This main stud kit is for all 12 and 24v engines.